East Down is located within North Devon local authority area., historically forming part of Braunton Hundred. It falls within Shirwell Deanery for ecclesiastical purposes. The Deaneries are used to arrange the typescript Church Notes of B.F.Cresswell which are held in the Westcountry Studies Library. The population was 311 in 1801, 326 in 1901. In 1641/2 81 adult males signed the Protestation returns. A parish history file is held in Braunton Library. You can look for other material on the community by using the place search on the main local studies database. Further historical information is also available on the Genuki website. 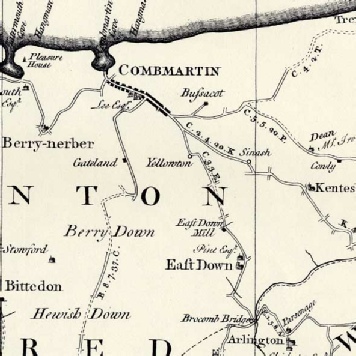 The image below is of the East Down area on Donn's one inch to the mile survey of 1765. The National Grid reference for the centre of the area is SS602418. On the post 1945 National Grid Ordnance Survey mapping the sheets are: 1:10,000 (six inch to a mile: sheet SS64SW, 1:25,000 mapping: sheet Outdoor Leisure 09, Landranger (1:50,000) mapping: sheet 180. Geological sheet 293 also covers the area. Click on the headings below to view an information sheet on various local landmarks. We are indebted to the Shirwell Magazine for the foregoing articles which were published between April and October 2000. Thanks also to Brian Sherwin who managed to trace the one missing article! It is believed that the above articles were written by Ian Cooper, a local historian.